What a great start it was for Joe McKeehen, eliminating three of his fellow November Niners on Day One! Poker fans all over the world have been waiting to see how this year’s November Nine was going to unfold on Sunday. McKeehen who came to the finals with the highest stack of chips, 63.1 million of them, kept piling more chips and elevating his advantage. 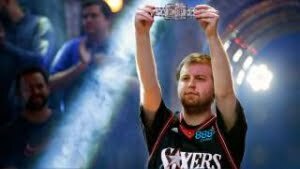 He elbowed out the competitive German poker player, Alexander Turyansky, last July at the close of the WSOP main event. Alexander Turyansky ranked number 10 overall, one step to qualifying for the November Nine. Joe McKeehen is only 24 yrs old and is close in age to his fellow finalist, Thomas Cannuli from New Jersey. He looks forward to another great day of play on Monday when the remaining six players proceed with the poker finals. The games begin at 4:30pm and the venue is the Penn & Teller Theater. As usual, ESPN will air the poker tournament live and hope to increase its viewership, thanks to the accommodating poker law in Nevada. McKeehen who came into the poker finals with a stack of 63.1 million chips now has a whopping 91.1 million of them. This means that out of all the chips to be utilized at the final table this year, McKeehen is controlling 57% of them at this stage. The competitor closest to him in the chips count is Zvi Stern from Israel, who came into the finals with a stack of 29.8 million chips and now has 32.4 million of them. First to exit the finals of the WSOP tournament on Sunday, November 8th, was Patrick Chan. This poker player, who became McKeehen’s first victim, ranked 8th in the number of chips he brought with him to the poker tournament finals. By the end of the main event last July, he had accumulated 6,225,000 in chips. At the time he had managed to marginally beat number nine in the race, Federico Butteroni. The next poker player McKeehen beat on Sunday was Italian Federico Butteroni, who entered the WSOP finals with 6,200,000 chips. The third victim of the poker finals on that same day was Pierre Neuville, the Belgian poker veteran who is over 70yrs old. It was a feat for McKeehen, beating this elderly but formidable poker player, who has been an inspiration to many players particularly because of his advanced age. This time, however, he has ranked number 7 in the finals. Joe McKeehen has a good education and graduated with a math major from the Arcadia University. Evidently, though young in age, he is wise in handling himself in public. At this juncture, he has decided to avoid media interviews until the November Nine poker finals are over. Unlike his fellow contestant, Cannuli, whose early play was dominated by online poker, McKeehen made his first memorable poker debut in 2010 at the Turning Casino which is in the city of New York. He was then 19yrs old. From then on, he returned for more poker games in the same casino and continued to earn more cash. He even played in the state of Florida as a side trip before he was 21yrs, after great performances in poker tournaments at the Turning Stone. In 2012, McKeehen came top in the Turbo Event of the Caribbean Adventure hosted by PokerStars and his takeaway was $2,000. In the poker Six Max High Roller event, he came 10th. Of course, he has won many more cash prizes since then, but the highest so far was last year in WSOP’s “Monster Stack”, where he bagged $820,863. That amount now dwarfs in the face of the possible winning of $7.7 million this week.